Performance Engineering completed a structural evaluation and analysis of building 512 at Valmont Industries Valley, NE facility. This structural review was completed in conjunction with their bridge crane upgrade project for this same building. This building is a pre-engineered metal building that has had multiple renovations and changes over the years, including the addition of gantry cranes at many locations, and an additional bridge crane. The building was experiencing notable deflections and movement from the crane use. Through extensive field verifications completed around Valmont’s production schedule and detailed structural analysis, Performance Engineering was able to design reinforcement for this existing metal building, and allow for the continued operation and upgrade of the bridge cranes. Extensive field verification of existing structural members. 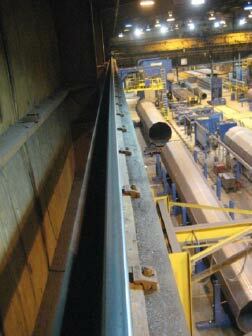 Many of the existing metal building frames had been previously reinforced using welded steel cover plates. Various amounts of existing reinforcing were measured across the full length of the building. Detailed structural analysis of each metal building frame was completed using the field data and building loads. Structural documents were prepared showing the required structural reinforcing necessary for each metal building frame. Site inspection of the steel reinforcing and welding was completed during the construction phase.